The increasingly stringent requirements of modern strip coating plants for high-quality coatings from various alloys (Zn, ZnAl, ZnMg, AlSi etc.) demand reliable and specially designed inductively heated coating pots. 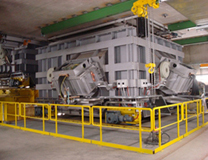 INDUGA offers suitable customised solutions. 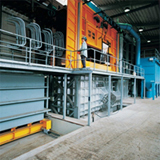 Ceramic-lined and induction-heated galvanizing furnaces are increasingly being employed for the hot-dip galvanizing of parts. Induga also has many years of experience in this field with relevant reference projects.